I am not a painter. The medium is neither my passion nor my gift (though I have grown up watching hundreds of painting shows on PBS with great enjoyment). Being an artist, I can fudge my way through, but it is always a struggle. Acrylics entice me due to their quicker-than-oil drying time (also an enemy), low or no odor, water-based nature and easy cleanup, thoughtless mixing and thinning, relative low cost, etc. The cons for acrylics are the quick drying time (ironic), too smooth, hard to cover, no re-working, etc. 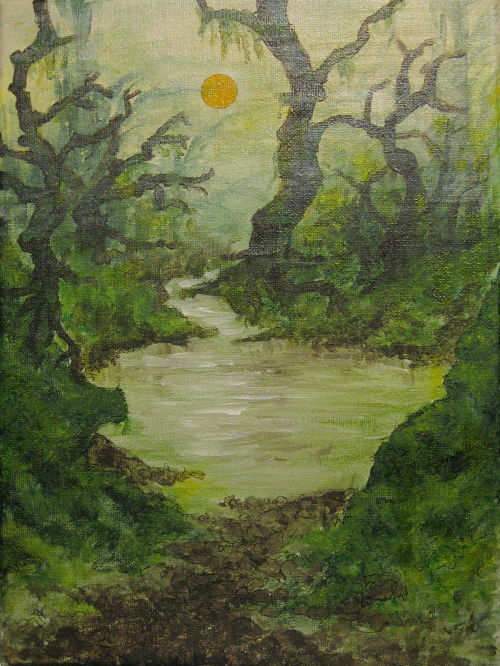 At any rate, Sullen Jungle is my first attempt at painting in several years. I can virtually count the total number of my paintings on one hand (okay, maybe a dozen in all). None of my paintings brings me much satisfaction, and this is likely my most pleasing work thus far. Sullen Jungle was secretly painted during an overnighter prior to our designated gift exchange for Christmas 2006. Due to horribly lacking supplies (only one brush! ), the sharp edges, fine lines and other elements were achieved with Copic Markers on top of the acrylic paint. The painting forms the background to a more thoughtful and imaginative work, Manga Deny.